the idea of skiing the north face of the größes palfelhorn (2222m) came to me as i looked over the wimbachgries from the ofentalscharte after a late fall training tour in steep snow and mixed terrain. i had never heard of anyone skiing this face. 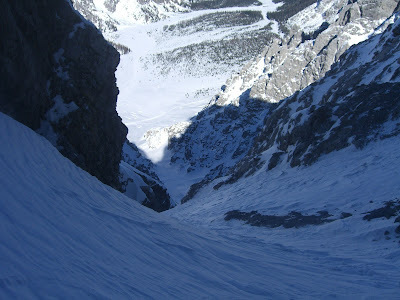 the obvious couloir that dominates the north face is wide and inviting two-thirds of the way up the face. afterwards it was unclear if it went further and if it would be possible to reach the top. the first step in the process was to enlarge a digital topo map and see if there was a possibility. I also looked to see if there was any recorded routes on the face. 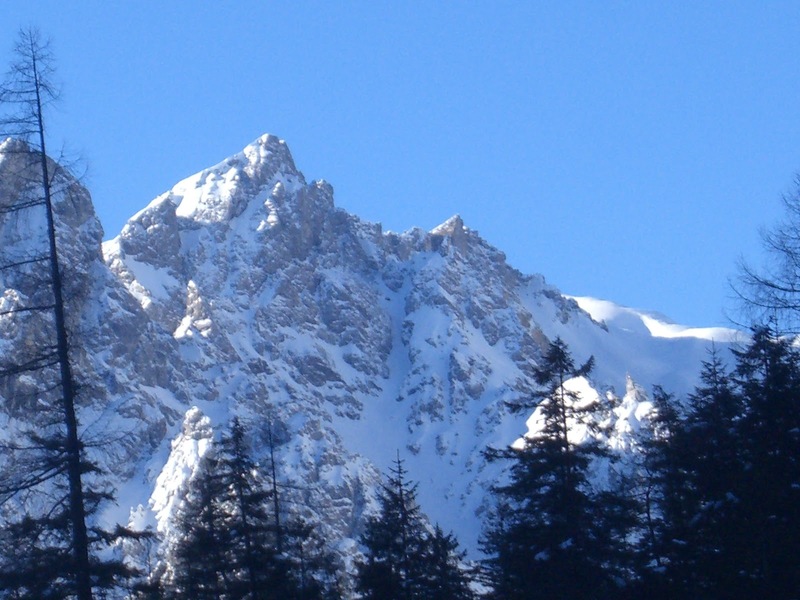 sure enough, there are some historical routes (pre WWII) on the größes palfelhorn and its sub-peaks that are described as very dangerous due to the crappy, extremely friable rock that makes up the peaks that line the wimbach drainage. no surprise there. i enlarged and studied the photos i took from the ofentalscharte, trying to discerne possible lines on the upper face. 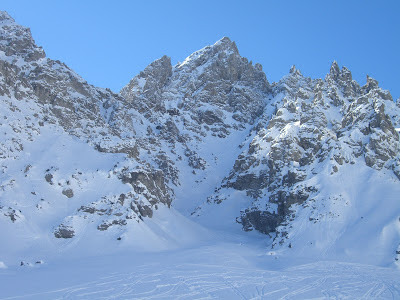 this past november, after a bit of snow, i went into the couloir for the first time. on a training tour with my short approach skis and two ice tools searching for a bit of early season ice. 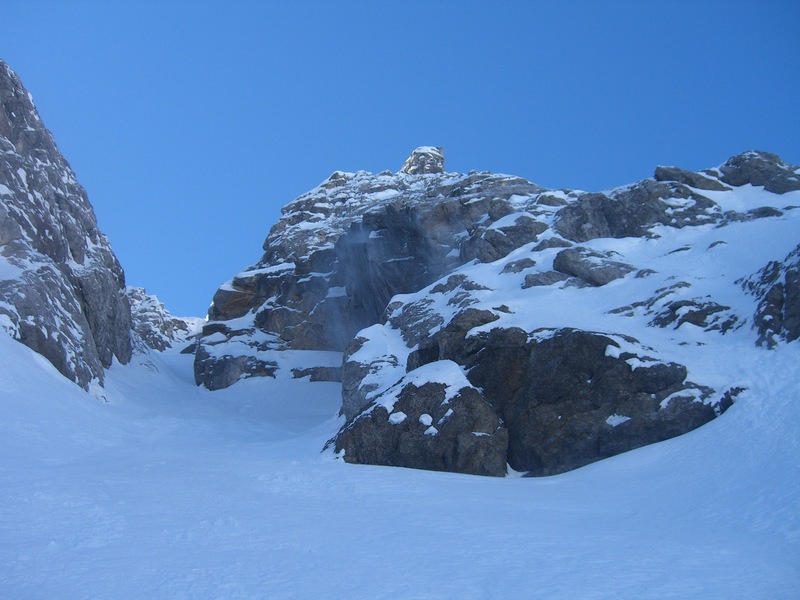 the couloir is filled with very large boulders and small rock walls that would need a lot of snow to fill in. last friday, march 1st, i went into the wimbach drainage to check out some unclimbed alpine ice. 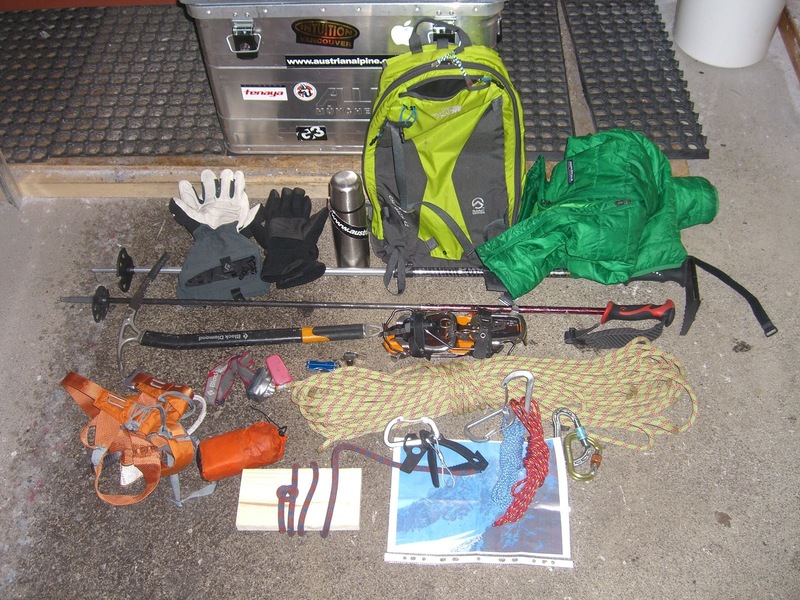 i had a relatively heavy pack with minimal ice climbing gear and two 30-meter twin ropes. 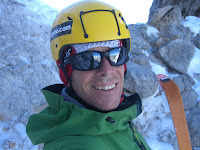 i wanted to see if there was any possibility of climbing some of the alpine ice that forms seasonally. i skinned in on my ski mountaineering gear, using dynafit tlt performance boots and my shorter dynastar mythic rider skis. the forecast of clearing weather burning off the low-level fog never materialized. i could not see whether any ice had formed. however every 30 minutes or so came the loud freight train rumble of avalanches releasing and rock fall as the sun warmed up the upper slopes of the mountains above the fog line. i wasn't going to blindly wander into that. so plan “b” was to continue in the couloir on the north side of the palfelhorn. i got up to about the 2000 meter mark (above the fog line at 1600 meters) before the weight of my heavy pack full of unnecessary gear drained my motivation. the clouds and fog had also started to come up from the valley making visibility poor and i was also a bit nervous and scared about going higher. i de-skinned and skied down in settled, cold powder from my high point. i could go back into the couloir on the following monday, march 4th. this time i went with the appropriate gear that i would need for the climb and descent. i wore thin long underwear under soft-shell pants and my arteryx mx hoody. on my head was a head band under my grivel helmet with sunglasses. light weight fleece gloves on my hands. i used my tlt boots, dynastar skis and of course skins. no, i did not have avalanche rescue equipment. and yes, i was alone. in this manner i could move fast and had enough material and equipment for soloing moderate terrain and getting out any trouble by rappelling or self-belaying if needed. i skinned into the shadow of the couloir and out of the warm sun of a perfect day. 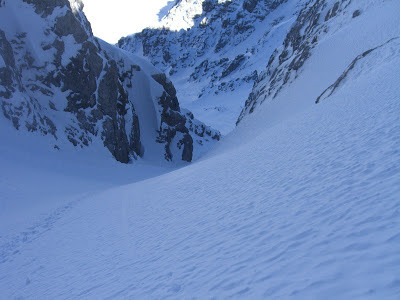 i was surprised to see a second set of ski tracks coming out of the couloir. it turned out that some one had followed my skin track from the following friday up to about the 1600/1650 meter level before skiing down. i quickly reached my previous high point and continued for another 50 or so meters before i put my skis on my back and boot packed up the steepening gully. the crux of the descent would be a steep and narrow section bordered by rocks. i topped out of the couloir at just under 2200 meters, following the right branch to a small notch. as i neared the end of the couloir, there were steady spin drifts that would wash down the gully as snow as blown off the rocks above and bordering the couloir. the snow was a mix of cold powder, wind pressed powder, breakable wind slab and hard wind slab. at times i simply had to ski from one jump turn to another to control my speed. at other times i could link a few turns, and towards the bottom of the couloir the snow was much better and just fun to ski. i have been watching the classic ski films “blizzard of ahhs” and “steep” lately. the films feature scott schmidt, glen plake, doug coombs, the great french steep skiing pioneers, etc., and steffano de benedetti. i find the films, and especially the comments of de benedetti extremely thought provoking and inspiring. however the best line from “steep” goes to glen plake. to me it’s a metaphor because we tend to put ourselves into various forms of confinement, whether it is a necessary part of life or a self-imposed limitation of our true desires.